Sure, sure. We all acknowledge that there’s a weird, almost reciprocal relationship between David Bowie and Iggy Pop. I can’t shake the feeling that the former has somehow used the latter for decades of artistic inspiration that’s as calculated and poised as Iggy’s art isn’t. But not without paying for it, of course! Bowie is nothing if not assiduously fair minded in his desire to help out an artist he’s genuinely in awe of, and has of course, thrown friendship, support, and even money at Iggy’s way at every opportunity. Not the least of which was covering some of Iggy’s tunes to channel some royalties in his direction. Iggy probably lived off of “China Girl” revenue for the better part of a decade, but that didn’t stop Bowie from recording more covers on the unsuccessful [compared to “Let’s Dance”] “Tonight” album. It should have ended there, but Bowie had to press his luck. He made the mistake of covering one of my very favorite, if atypical, Iggy Pop tunes for his “Never Let Me Down” album. But let’s start with Iggy’s version. “Bang Bang” was a fish out of water track on The Ig’s “Party” album of 1981. It was one of a few tracks on that album that was produced by Monkee-writer Tommy Boyce in an effort to see if Iggy could cross over into the charts with some slicker production than he usually had. Sure, Pop’s RCA Berlin albums were well produced, but they were kind of “artsy.” Tommy Boyce knew from hits! So the song, which is a typically phallic Pop anthem, has been burnished to a previously-unheard-of high sheen with all manner of sonic filigree; guitars, bass, and drums have been abetted with wooshing synthesizers, mountains of reverb, and even a string section in order to craft the closest thing to a Phil Spector produced Iggy Pop record imaginable at that time. If Phil was producing The Ramones, why not? Why not indeed? Arista were confident enough to press promo 12″ers [what has happened to my copy? – ed.] of this and three other “hits” from “Party.” This song was my entree to the world of Iggy Pop. This track was played on WPRK-FM and it sounded like a corker to my teenaged ears. The unfolding, Chinese puzzle box style of the production presaged the technique that Trevor Horn would very soon be cranking up to its highest level very soon. Namely, give every verse and chorus some factor that made it stand out in the song and keep the whole thing fresh as it moves propulsively from beginning to conclusion. The net result is the Iggy Pop song that yeah, you might have heard in a “rock disco” of the time. It was as dynamic as all get out and still, at its core, it was a ode to priapism with every conceivable metaphor for erections touched upon [sorry] such that only Iggy could have penned it, albeit with help from Ivan Kral on loan from the Patti Smith Band. After Bowie mined gold with “China Girl,” I’m sure he mulled over other tunes from the Pop canon to re-jig for the charts. When he picked this one six years later, I could have hardly believed it. I studiously avoided this album at the time of release. I went cold turkey on Bowie after the Let’s Dance” single lost me but good. New Bowie albums would be released and ignored by me. Oh, I noticed them on MTV, and still found them very wanting, so I never purchased. When this one came out, Bowie [like everyone in the horrible mid-80s] was sporting a mullet and seemingly adrift artistically. The Glass Spider tour behind this clunker would have been my first chance to see Bowie in the hellhole that is Florida, but I was wise enough to pass on that bait. I didn’t actually hear this album until a dozen years after its release. I had re-joined the Bowie career [already in progress] with “Tin Machine,” after which he seemed to have come to his artistic senses somewhat. I still gave the EMI trilogy from hell the big pass, until hearing 1999’s “Hours” got me interested in hearing even those. I needed to finally hear the big Bowie picture; warts and all. So I had a friend buy me a copy of this CD from my wantlist for a birthday or something. 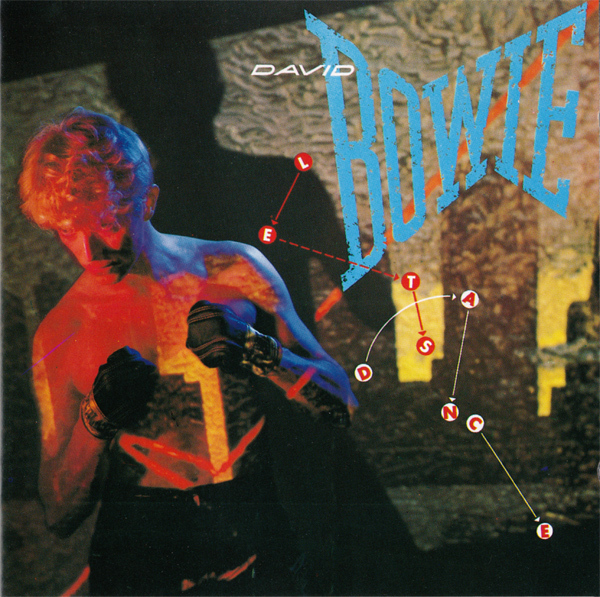 This album was in some ways worse than “Let’s Dance” or “Tonight” in that it sounds like Bowie is trying hard to be “David Bowie” and still failing. As it played to my ears for the first time in 1999, I felt a creeping dread as the final track approached. 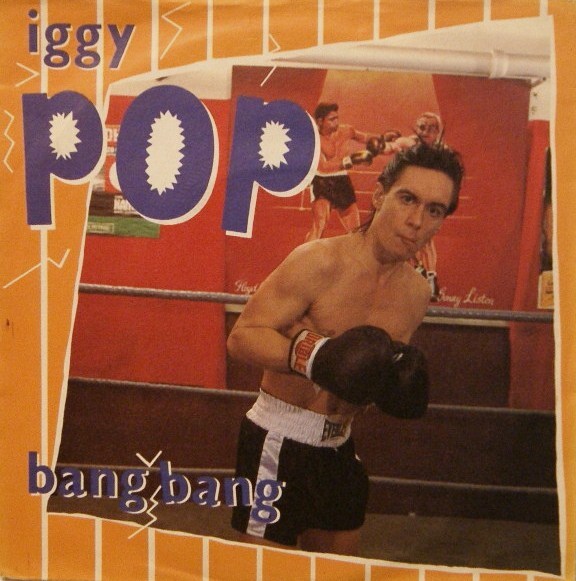 “Bang Bang,” after all, was a long favored Iggy Pop track I’d enjoyed since its release. Could it withstand a be-mulleted Bowie trampling all over it? Considering that the sonics of the original “Bang Bang” almost seemed to presage the “sell out phase” of “Let’s Dance” with alarming clarity, the commercial landscape had changed immeasurably in the six years between versions. The “everything but the kitchen sink” naiveté of the Pop version was trampled underfoot by the perfected and codified corporate rock sonic Humvee® of the Bowie version. There’s not a single note or sound out of place on the cripplingly soulless remake. Indeed, it proffers not a single surprise to the ears; unlike the charmingly willing-to-please original. Bowie’s vocals sound phoned in. The chameleon was out of colors at this point. He was covering a song about trolling for underaged girls! * What in hell was Bowie thinking? The last time that Bowie had sung convincingly about pursuing women was “in character” as zIGGY [pop]Stardust on “Suffragette City,” fifteen years earlier. The key to the original song was the middle eight, where Iggy intimately and dryly intones “I want no intimacy” in his best voiceover baritone before stepping back into the bright lights and reverb and declaring “Lonely? Hah! What does it mean? Who? Me?? !” in a manner that’s tantalizingly ambiguous. Was Iggy really celebrating mechanistic coupling or was he letting the listener see the hollowness inside of it all? Either viewing has validity within the song. Bowie, the former master of ambiguity, stumbles blindly through the song without a clue as to a single interpretation of the lyric, much less two. Crucially, Bowie changes the lyric above from “I want no intimacy” to “I wandered lonely to the sea,” yet he keeps the “Lonely?” rejoinder, which signals to me he was not picking up on the ambiguity that Pop was investing into the song. It’s possible to interpret that Iggy was subconsciously baring his emotions while denying that he had any at all. 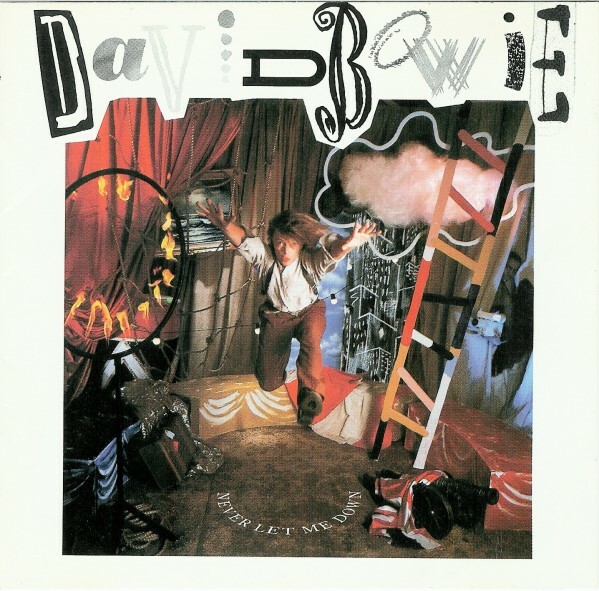 That is the mark of art, and Bowie’s ham-fisted cover isn’t even particularly deft commerce! 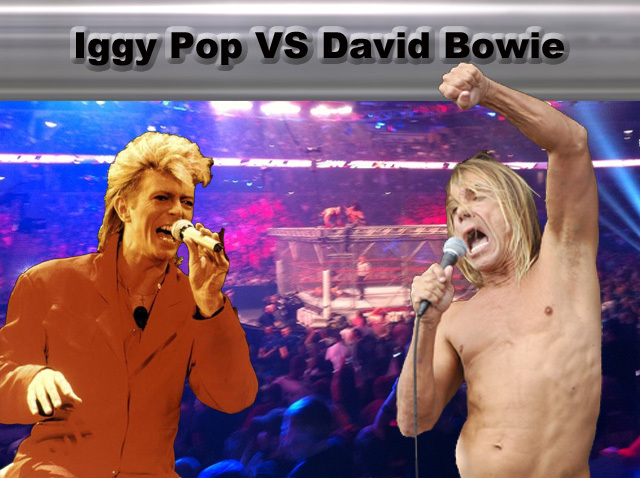 Bowie takes it on the jaw – his glass jaw, as Iggy sails his way to a knockout! And finally, I should mention that I’d never seen that “Bang Bang” cover before researching the catalog number of this single. Does it look a little… familiar? * Speaking of shameless, one of Iggy’s “hobbies” back in the Detroit days of The Stooges was to poach high school girls [a decade too late] via the nervy method of ingratiating himself with every drop of his considerable charm to the [underage] girl’s parents before making his move… by then with their every blessing! This entry was posted in Steel Cage Match and tagged David Bowie, Iggy pop. Bookmark the permalink.